The constellations Taurus, with its Pleiades (a tiny "dipper-like" asterism), Orion and the Winter Triangle are now sinking in the W. Castor and Pollux (the Gemini "twins") are shining in the NW while Capella (Auriga) glows above them. Regulus (Leo) shines high in the S as the wandering constellation Hydra appears to create a void below since it has no bright stars. The "Big Dipper" asterism (Ursa Major) high in the NE has appeared to "rotate" so its "handle" is now nearly horizontal. Spica (Virgo) and Arcturus (Bootes) are now rising in the E. Spring is coming! MERCURY will be visible in the evening sky this month, lost in the Sun around the 5th, reaching inferior conjunction on Jan 15. VENUS low in the morning twilight sky favoring northern hemisphere observers. MARS, losing magnitude and diameter, is moving from Aries into Taurus this month. JUPITER rising higher in the morning twilight is still low in the constellation Ophiuchus. SATURN will be in the morning sky, rising 2 hours after Jupiter. URANUS sets early in the evening and will be favor northern observers. 01 Saturn 0.3 deg. S. of Moon occultation from northern Micronesia, Cen. America, and southern N. America. 02 Venus 1.2 deg. N. of Moon. 07 Neptune in conjunction with the Sun. Vesta in conjunction with the Sun. 10 Daylight Savings Time begins for affected locations. Uranus 5 deg. N. of Moon. 11 Mars 6 deg. N. of Moon. 13 Aldebaran 1.9 deg. S. of Moon. 15 Mercury at inferior conjunction. 17 Moon 0.5 deg. S. of Beehive cluster (M-44). 20 Earth at Equinox, Sun rises due east and sets due west. 21 Look W from a dark location, at about an hour after sunset, to view zodiacal light. ("Zodiacal light" is a vertical band of white light believed to be sunlight reflected from meteoroids found in the plane of the ecliptic, the apparent "path" of the Sun, Moon and Planets as they travel across our sky.) It will appear to be a very large, but very dim, pyramid of white light, "leaning" to the left. This effect may be visible for the next two weeks on dark nights. 27 Jupiter 1.9 deg. S. of Moon. 29 Saturn 0.05 deg. N. of Moon, occultation from E. edge of Brazil, southern Africa, Madagascar, S. tip of India, and Sri Lanka. In the north, the evening winter sky sparkles, boasting of the brightest star as seen from Earth, the dog star Sirius and the giant hunter, Orion. They rule the sky with the bright stars and the twin constellation of Gemini. But they are are led across the night sky by the more northerly constellation of Taurus, the ecliptic constellation that has been associated with a bull. The bull is rather enigmatic to some, for although constellation maps may show horns, it is difficult to see more than one leg on the bull as it charges across the sky. The first magnitude star Aldebaran marks the eye of the bull, nestled in a triangular shaped group of stars that forms the "face" of the bull. The triangular face of the bull is a very important star cluster, the Hyades. The center of this cluster has been measured by astronomers to be located about 150 light years away from the Earth. The fiery eye of Aldebaran is not a member of the cluster, but resides about midway between our Sun and the Hyades center. The Hyades cluster is nearby as clusters go, only the Ursa Major Star cluster is closer to us. The cluster was noted by ancient astronomers and was thought by some to indicate rain. It may be that when the cluster was prominent in the sky many locations on Earth experienced their "rainy" season. At least 10 stars in the cluster are fourth magnitude or brighter, with four of the brightest being well studied red giants. The brightest Hyades is the red giant Theta-2 Tauri, a spectroscopic binary. It forms a pair with Theta-1, a pleasure to observe with the naked eye, however the two stars are actually 4 light years apart and are not a true double star. The cluster is believed to be about 400 million years old based on star types of its members. The cluster may well appear best as a binocular object, contains no nebulosity and covers about 4.25 degrees of the sky. 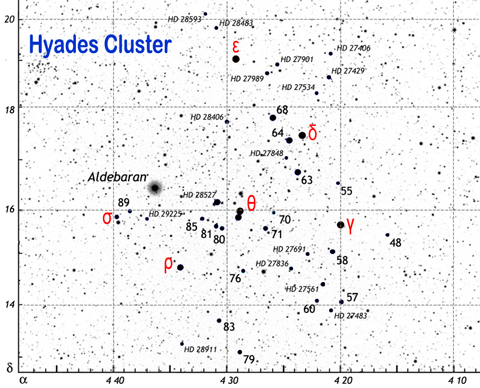 The Hyades cluster is very important to astronomers because the proper motion of each individual star can be measured. Stars at the center of the cluster are moving at .11" annually, but outlying members show a more or less motion based on their position in the cluster. This means that the cluster itself is useful for establishing the size of the universe. The chart below shows the Henry Draper designations of the brightest members of the group except for the bright ones that have greek designations. The scale along the bottom is the right ascension and the vertical axis shows the declination. The bright star Aldebaran is the only non-member in this chart that has been labeled. This chart was originally created by Thuvan Dihn and licensed as stated below.. The Hyades will set around 2 am this month. They rise and set with the bright star Aldebaran and reside on the ecliptic opposite their famous half-sister, the Pleiades cluster. These two star clusters are among the finest in the night sky. 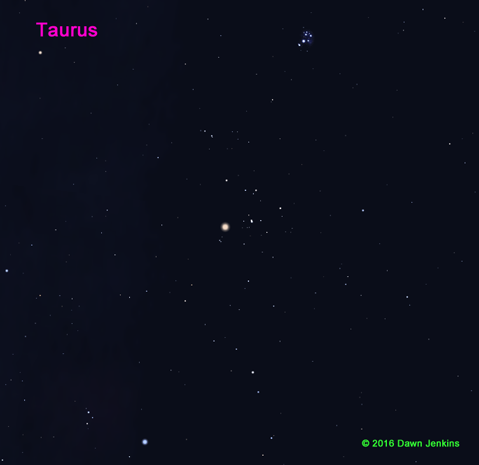 The star chart above was generated by Stellarium, a free open source planetarium program. The above image was created by Dawn Jenkins, using Stellarium and a graphic editing program to format the image for this web page. The Hyades star map was created by Thuvan Dihn and posted thanks to Wikimedia Commons. Find the file here! This installment of "What's Up?" is ©2019 by Dawn Jenkins for Astra's Stargate. View Ron Leeseburg's Farewell Issue for information on where to find information such as is presented in this almanac.